A tick over two minutes into the tilt, the Bears led 4-3. At which point, they would have been best advised to find the nearest bomb shelter. But, Mizzou State did not bunker down. Montrezl Harrell second-chance deuce. 6-4. Rebound follow deuce by Mangok Mathiang. 13-4. Terry Rozier second chance jumper. 15-4. 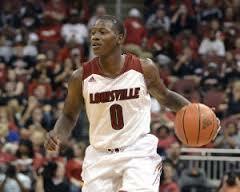 Terry Rozier snow bird after stealing inbounds pass. 19-4. Talk to me, John Lee. Cue the Boogie Cam. This one was over before the break. The crowd was left to frolic on cue from the Kroger Krewe. Festivus came early. Against the tall, previously 8-1 visitors, U of L played certainly its best half of the year — the first — and arguably its best game of the season, despite some tail off after intermission. The Cards had a 27-10 advantage on the boards at halftime. Thirteen of those were off the riverside offensive glass. Six of them were snatched — yes, I’ll say it again, like a Venus Fly Trap — by Terry Rozier.2 He also tallied 8 points before the break, along with a block and a steal. 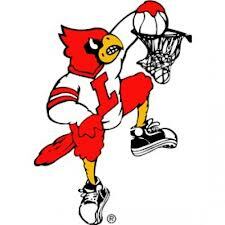 The important area that remains troublesome for Louisville is free throw shooting. Russ, Blackshear (87%), Jones (78%), Hancock (92%), Henderson (2/2) and Van Treese — yes, SVT — at 71%, are doing their part. The improvement needs to come from Silent L, Mango and Chane. The Rick put in a new offensive set. Which is essentially an NBA-style clear out for Russ Smith. He either gets to the hoop for an almost automatic score, or gets fouled. Either way works. I assume it will also be run for Jones, though I don’t recall that happening last night. Constantly improving Wayne Blackshear hit 3 of his six attempts from beyond the arc. For the season, he is now a truly glossy 21/46. That’s 46%, kids. We’ll take it. I’m not going to go through the whole box score. Other than to say, I love the balance. Though whistled as a team for only six more fouls than Louisville, three Missouri State ballers bagged the limit. Not only did the late start not hinder attendance, it obviously enhanced it. There were noticeably fewer empty seats than the last several games. Plus, the students were feistier than they’ve been. It’s a good thing. I luvs me some John Lee. If you really like Terry R. so much, why don’t you explain why your coach Cal won’t recruit players like him since they obviously don’t have OAD type ability? I am sure that your type would much rather have a 6’6″ statute at the point who is NBA ready than a project like TR, right? At which juncture, the Cards already had a 20-5 rebounding advantage, and 5 nil assist advantage. Who, if you haven’t been paying attention, is my favorite new Cardinal. And, rising fast among the list of all-time faves. How fortuitous that Rozier wasn’t able to matriculate last season, when he obviously wasn’t needed. Thus he could fine tune his game at prep school in advance of his righteous debut this December in red & black. Why does that always make us smile? Russ missed 3 of his 6 attempts, but one has to assume that’s an anomaly, since he’s hitting 74% on the season. Maybe those kids were really studying the last couple of weeks. Hard to figure, but, well, stranger things have happened.